Written by Chalmers Award­-winning playwright Rex Deverell and directed by Simon Malbogat, Photographic Evidence is a fictionalized account of the remarkable life of famed Canadian photographer Geraldine Moodie as she wrestles with the confines and constraints of womanhood in the 19th century and her husband’s complicity in the Canadian colonial enterprise. After premiering to rave audience reviews at Heritage York’s Walk the 6 West event, this newly expanded version stars Kat White (Top Girls, Theatre Erindale) as Geraldine Moodie, Louis Adams (Twelfth Night, Soulpepper Theatre) as her husband John Douglas Moodie, and Lisa Nasson (Spirit Horse, Roseneath Theatre) as the mischievous narrator Camera. Photographic Evidence is production managed by Lucas Andersen (Shelf Life, Mixed Company Theatre) with costume and prop design by Laura Delchiaro (Coriolanus, Stratford Festival). 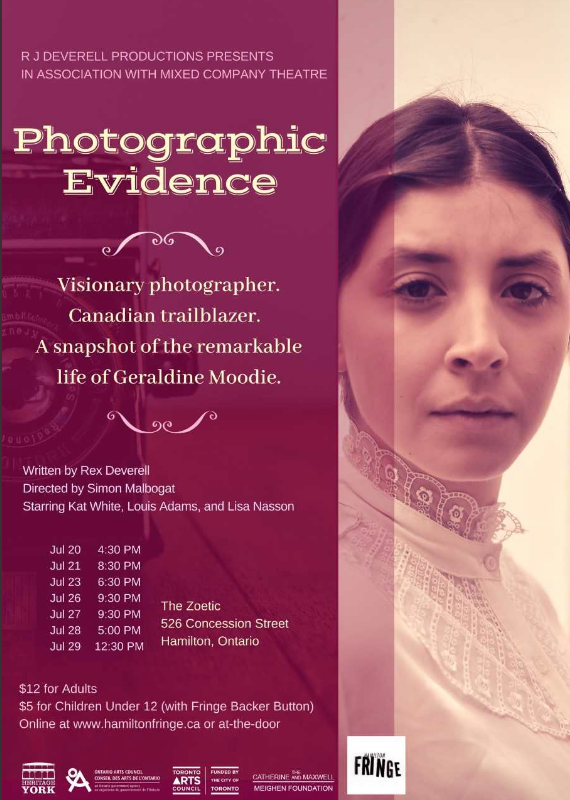 And we’re all set to bring this beautiful play about Canada’s first professional woman photographer – to the Hamilton Fringe 2018 this July! Canadian photographer Geraldine Moodie was born in Toronto, 1854. 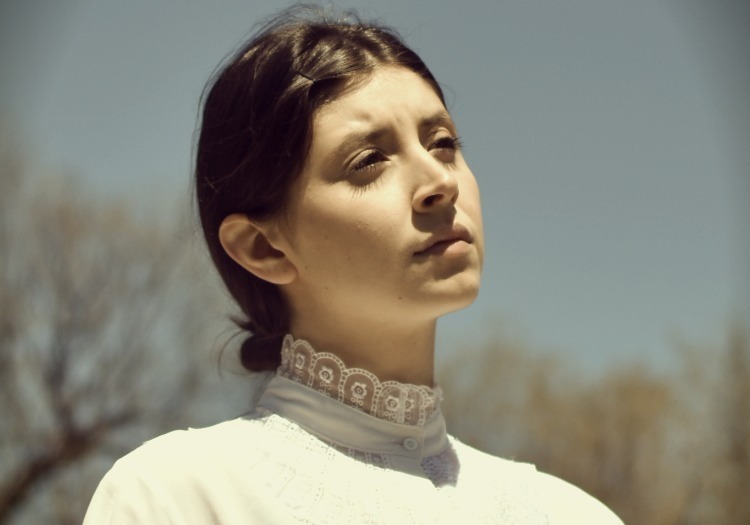 She comes from a long line of writers and artists including her grandmother, famous pioneer writer, Susanna Moodie, her great aunt writer, Catherine Parr Traill, and her artist mother, Agnes. Geraldine met and married Robert Douglas Moodie while on an extended visit with relatives in England. He joined the North West Mounted Police after receiving a commission as Inspector in 1855 and took his family to Calgary – the first of many postings. Known for her photography of the Indigenous Peoples from Canada’s North West and Arctic regions, Geraldine’s work became more influential and successful than many of her male contemporaries. Like many of the artists in her family, she also had a fascination with documenting the wildflowers of the Canadian wilderness. The contrasting nature of her images reflect a deeply compassionate personality torn between conflicting desires. Although the play is a fictional reconstruction, it is based on true events and extensive historical research.